Socio-economic volatility and the rise of anti-establishment politics will characterise Greece’s most important election in nearly 40 years. The likely outcome is a coalition government, but will it be able to undertake the substantive reforms Greece badly needs? Greece is one of several countries in Europe facing elections in May. But, if polling is to be believed, there are few countries in Europe that are experiencing as drastic an electoral shift as has been occurring in Greece since the onset of the crisis. Daphne Halikiopoulou and Sofia Vasilopoulou argue that the social and economic uncertainty brought on by Greece’s dire economic situation has led to a massive move of public support away from traditionally popular parties to those of the far right and left. As many as eight political parties may be entering the Greek parliament after the election on 6 May. Greece is in crisis. Greece is also in a pre-electoral mode. Within the context of a second EU and IMF bailout, unemployment levels of 19 percent, a social system premised on clientelism and corruption, social and welfare issues that will not go away such as pension, tax and health reform, and high levels of immigration, the upcoming election of May 6th is critical. This is possibly the most important election in Greece, following the restoration of democracy in 1974. It was demanded by the people on the basis of democratic accountability and legitimate governance. Major decisions need to be taken for the country’s future. What is Greece’s place in the EU? Should/will it remain a member of the Eurozone or return to the drachma? Will Greece be able to meet its lenders’ requirements or will it have to resort to a third bailout? Tough measures need to be taken to tackle these issues, and the current technocratic government lacks the legitimacy needed to ensure that laws can and will be passed in a framework of stability. In the context of increasing social unrest, the upcoming election is of paramount importance because of the problems and trends that accompany it- decline of the mainstream, political fragmentation, high electoral volatility and the rise of extremism. Polls point to the likelihood of the formation of a coalition government- an exception rather than the norm in the history of Greek political parties which do not have a good record of co-operation with each other. Polls also point to a large number of parties, many of them radical and/or extreme, entering parliament. Greece has the symptoms of any society in deep crisis. It is a society deeply fragmented into winners and losers. Traditionally this cleavage was translated into winners and losers from modernisation and Europeanisation -a division between those social forces promoting the ‘modernisation’ of Greece and those that sought to obstruct it. Now this line is more blurry. The main division is between those who stand in favour and those who oppose last year’s Memorandum of Understanding between Greece and the IMF which outlines how Greece will reform its economy in exchange for the IMF’s bailout. It is precisely this cleavage that informs and guides the current pre-electoral campaign. 36 parties will run for office on May 6th a huge number. Some of these are new, many having been established only recently from factions of larger old parties, such as the Democratic Left (Kouvelis – from SYRIZA), Independent Greeks (Kammenos – from ND), the Democratic Alliance (Bakogiannis – from ND), and the Social Pact (Katseli – from PASOK). Others are older, but previously marginalised groups, who are now appearing to be making a come-back, such as the extreme right neo-nazi Golden Dawn. On the pro-Memorandum side of the political spectrum stand the mainstream PASOK and ND (albeit critically) who are also the most punished in the polls. Also pro-Memorandum is the smaller Democratic Alliance. Opposing the Memorandum is a large array of parties, ranging from the radical right to the radical left. On the left-wing side of the spectrum, the radical KKE, SYRIZA and ANTARSIA premise their opposition on an anti-Western and an anti-imperialist rhetoric, blaming external powers and the domestic PASOK and ND for collaborating with them. On the side of the right, ranging from less to more extreme, the Independent Greeks, LAOS and Golden Dawn also blame external powers and Greek mainstream parties for undermining Greek sovereignty, independence and identity. This cleavage will determine the electoral outcome. The main features of the election will likely be: very high electoral volatility, partisan de-alignment and protest voting. This is highly likely to translate into the fragmentation of the party system with at least eight parties predicted to enter the Greek Parliament which will be the largest number of parliamentary parties since 1974. In the latest poll PASOK and ND together concentrate a record low 35.5 per cent of voting intention. If one considers that traditionally the two parties combined have concentrated around 80 per cent of the actual vote, occupying the vast majority of parliamentary seats, this prediction points to divisive tendencies detrimental for the future of the current party system. The decline of the two mainstream parties has been accompanied by a significant rise of extremist and anti-establishment parties of both the left and right. 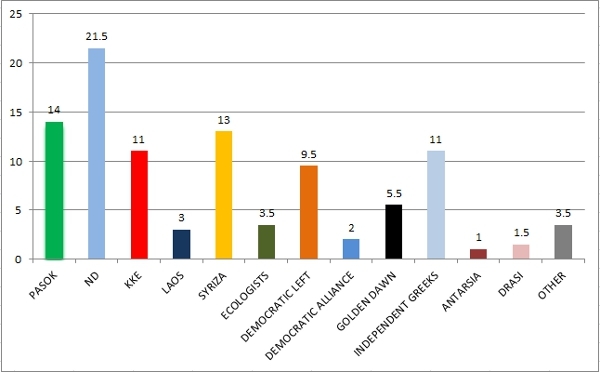 Perhaps the most worrying trend is the rise of the neo-nazi Golden Dawn at 5.5 per cent which would guarantee it entry into Parliament- the threshold for entry is at 3 per cent (see figure 1 below). With racist roots and an ideological basis premised on Nazism, the Golden Dawn is both anti-democratic and anti-systemic. It stands for a fully homogenous Greece free of immigration which they associate with high levels of criminality, an aggressive foreign policy which puts Greece’s territory to the forefront, a strengthened role for the military, an emphasis on the racial and ethno-cultural supremacy of the Greek people, and a paternalistic state. Alarmingly, it seeks to achieve these aims through the use of violence and physical force. Figure 1: Public Issue, Vote intention, April 2012. It remains to be seen whether we will have a German-style ‘Grand Coalition’ of the main two established parties, a coalition that would comprise of radical left or right wing parties or a minority government. The least likely outcome, based on the most recent polls, is a single party strong majority government. But how significant will the outcome of the election be? Substantive reform in Greece depends on the total dissolution of deeply embedded clientelistic structures. Echoing Peter Mair’s words in a book on the recent elections in Ireland, the upcoming Greek election despite of being of such critical importance may in the end matter very little both for Greece and Europe.